It's summer... and it's time to get outside and take in that natural Vitamin D and do all the things we love to do in the summer. You know you love it! But before you do that! Remember to take care of your eyes! They are exposed to so many irritants and stresses.... we often take our eye health for granted, but it's important to put on your sunglasses and protect them! The long term effects of not wearing UV protective eyewear is alarming. Closing in on 40 myself, we see changes happening in my vision and it makes me even more conscientious about what damage I may be causing to my eyes.... cataracts and cancer are only two of the many possible issues that may arise from not protecting my eyes, but they are big ones that I would love to avoid. Protecting your eyes doesn't require a lot of equipment. Actually, you just need to wear sunglasses with UV protection and a hat. If you don't like wearing both, please consider wearing at least your sunglasses to protect your eyes! My own father just had cataract surgery in both eyes. And he's way better about protecting his eyes! The Sunglass Warehouse is a strong supporter of promoting UV protection and has 100's of styles, frames to choose from. I chose to try out the Valencia, one of the Sunglass Warehouse polarized best seller. They cost $16.95, have bamboo temples, polarized lenses and look super cute! Of course, the Sunglass Warehouse has tons of more options to look at..... check it our for yourself! You may be thinking... but I wear sunglasses when it's sunny, in the summer. Isn't that enough? NO! You need to wear sunglasses everytime you go outside during the daytime in all seasons! Even on cloudy days. Yes. Those UV rays are still out there waiting to get your eyes! Read more about protecting your eyes here! 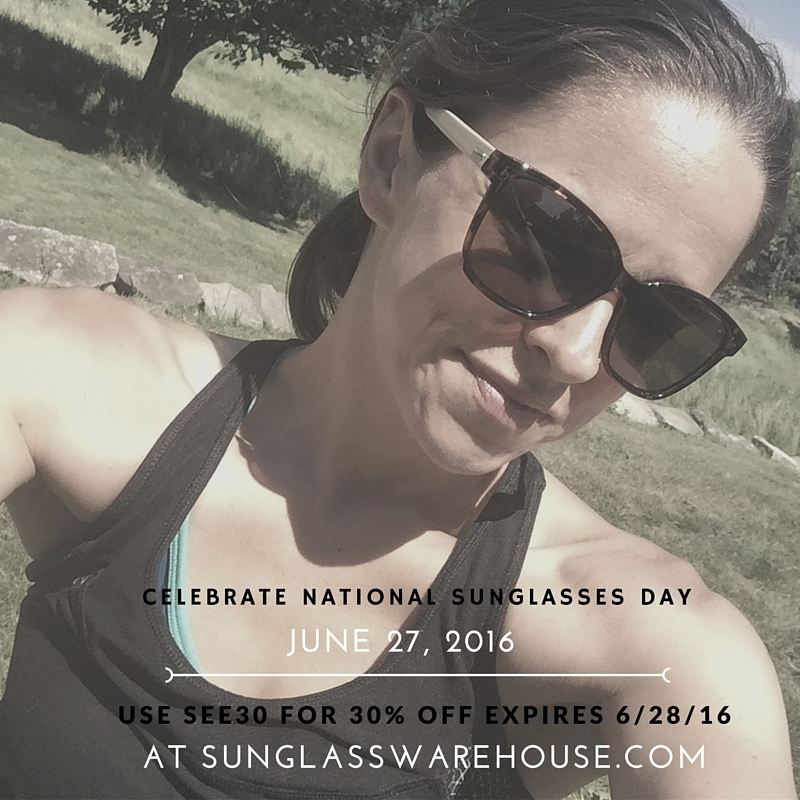 disclosure: I was sent a pair of sunglasses from the Sunglass Warehouse to promote National Sunglasses Day. I was not required to post a positive review. As always, all opinions expressed on my blog are 100% my own.